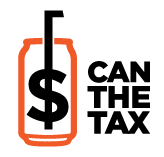 By signing our petition, you are indicating your support of Can the Tax's mission. Your name, address, email and any personal information will not be shared with others, including other members of our coalition, other than for the purpose of listing you as a supporter of this coalition. You will receive periodic emails from Can the Tax. You can opt out at any time via the link provided in all communications. We do not share the information you’ve given us with unaffiliated groups without your explicit permission. This means we may provide compilations of petitions, with your comments, to federal, state, or local policy makers or to the press. We will not make your street address publicly available, but we may transmit it to federal, state, or local policy makers as part of a petition. This is a standard practice in such situations. In no such case will we disclose your email address or phone number without your permission.